Iyengar yoga teachers are clear and direct. They observe and correct students with patience and skill. Click ﻿﻿here for an application form, and here to find dates and information for the 2018/2019 Pathway Yoga teacher training program. ​If you have any other questions please email Barbara. Iyengar yoga teacher-training programs meet worldwide standards set by BKS Iyengar. Training takes place over a minimum three-year period. During this time, trainees study anatomy, physiology, philosophy and teaching principles. They also apprentice teach with guidance from their teacher. To earn certification, they attend a rigorous assessment, where a panel of experienced teachers evaluates their teaching and practice skills. 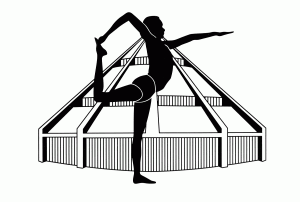 The Certification Mark, shown here, is the emblem of a certified Iyengar yoga teacher. Only certified teachers are honoured to use it. Iyengar yoga teaching has deep roots in long, uninterrupted practice. Before applying to teacher training programs, students have developed their Iyengar yoga practice over a period of years. Ongoing study and practice do not end with a teaching certificate. Iyengar yoga teachers commit to attending classes and workshops with senior teachers every year. 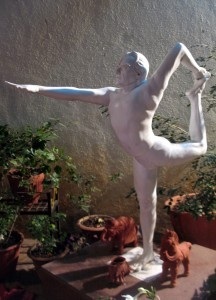 Many travel to the Ramamani Iyengar Memorial Yoga Institute in Pune, where they study directly with the Iyengar family.